GMO?? GM-Ohhhh?! And GM-NO!! - Anti-Age Naturally! I recently wrote an article about apples – the magic fruit with unbelievable health benefits. After that article went out I received an email from a reader pointing out that while there are tremendous health benefits in an apple, there aren’t in a modified one. Her email got me thinking that maybe I needed to expand on what to look for when buying an apple (and other fruits and vegetables), other than just saying to buy organic. The reader was actually talking about genetically modified (GM) foods. When something becomes GM, it has had its genes (DNA) changed through genetic engineering. So now it becomes a genetically modified organism or a GMO. In most cases GMOs have been altered with DNA from unrelated organisms like viruses, bacteria, plants or animals. These organisms are referred to as “transgenic” organisms. The first GM crop was tobacco, back in the 1980s. It was modified to resist insects. Well, the seeds were injected with pesticides and herbicides to create insect-resistant crops. And because it was successful, many farmers have adopted GM technology for other crops … worldwide. Engineering the seeds protected the crops and made them grow faster. In fact, in 2014 the use of GM technology increased crop yields by 22%, and farmer profits by 68%. But that was just phase 1. Tomatoes have been GM with antifreeze genes from a cold-water fish to resist frost and freezing temperatures, and also with pesticides to protect them from beetles. Tomatoes were one of the first fruits to be GM. They were modified to delay ripening but they never really softened. Watch out, though, because improvements have been made and the GMO tomato is making a comeback sometime in 2018. A few different varieties of potatoes have been modified to not bruise or brown. However, when fried they release a chemical called acrylamide, a known carcinogen. The new potato is called an Innate® potato and was developed by a major McDonald’s supplier in 2014. But, due to negative press, McDonald’s stopped using the Innate® potato in 2015. But the GM potatoes are still out there and being used by other fast-food chains and restaurants. And then there’s the Arctic® apple. But this apple doesn’t grow in the Arctic. It’s been GM in a lab to never brown and resist rotting. Scientists do this by targeting the production of the enzyme that makes it turn brown, essentially turning one of the genes in an apple off, or silencing it, which creates a double-strand RNA (ribonucleic acid) or dsRNA. But let’s stop for a second and understand what this all means. RNA is essential for DNA to remain stable. One of the tenets in molecular biology state that, “The flow of genetic information in a cell is from DNA through RNA to proteins: DNA makes RNA makes protein”. So it’s a clear communication system and well-oiled machine. But what happens when dsRNA from the Arctic® apple is introduced into the body? Scientists know that it doesn’t get destroyed in the digestive system and that it goes into your bloodstream, spreads to your cells and interferes with your DNA. Unfortunately, there’s no telling yet how it’s going to affect your DNA. And everyone may react differently. Also, when the RNA is silenced the apples’ defense to insects is also silenced. So now the Arctic® apple will need more pesticides for protection. And sadly, the silencing also turns off the most important nutrients in the apple as well, which are the polyphenols. 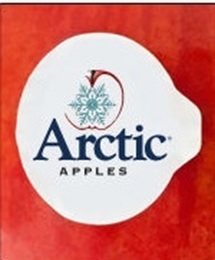 The Arctic® apple started to hit store shelves across the country this past November. Beware because they will be at your fast-food restaurants and anywhere you purchase sliced apples. They will not be labeled – GMO. They will be marked with their logo, a snowflake. Something like the picture to the left. Some other fruits and vegetables you should know that have been GM are: seedless watermelons, papayas, yellow crookneck squash, zucchini, alfalfa and pink pineapples. Yep, that’s not a typo – pink pineapples. In the U.S. alone 90% of all corn, soybeans, sugar beets, cotton and canola oil come from GM seeds. And the same crops account for 80% of the GM crops worldwide. Rice and wheat crops are also affected. And it trickles down to almost everything. It’s hard not to eat GMOs because many of these crops are used in processed foods, mayonnaise, salad dressings, bread, cereal, dairy products, cookies, margarine, soups, sauces and just about anything and everything you can think of … it’s just scary. GE (genetically engineered) salmon showed up in stores last August. It’s sold under the company name, AquAdvantage. GMOs are also affecting our animal food source because many of them are fed with GM seeds and grains. 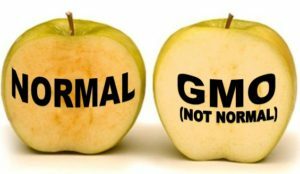 To top it off, since the release of the AquaAdvantage salmon and Arctic® apples, many companies are right behind them with their versions of GM foods. Get ready for designer fruits and vegetables to entice you. In many cases they tout that they are improving the nutritional value of foods by giving them added vitamins and antioxidants. And that they’re making fruits sweeter than ever. The FDA, scientists, and the biotech companies claim that GMOs are safe. They’re just lies designed to line the pockets of big Agra, Monsanto and biotech engineers with more money and market crops that never die, like Frankenstein. But that’s a whole other article. What you need to know is that according to the Executive Committee of the American Academy of Environmental Medicine, “GM foods have not been properly tested for human consumption”. There is zero funding for testing. And it’s not in anyone’s best interest to test. You can look for the “Non-GMO Project” label. But that only means that it’s been tested for GMOs, it doesn’t mean it’s organic. That means there is no guarantee your food will be free of other contaminants like Roundup herbicide, sewer sludge, growth-promoting hormones and toxic residues. Also, in the U.S., just because a product is labeled non-GMO doesn’t mean that it is. The only way to know is if it has the Non-GMO Project seal on it (pictured left). If you can, it’s best to choose “100% Certified Organic” because it’s also non-GMO. USDA organic regulations prohibit any genetically-modified (GMO) ingredients in a certified organic product. It doesn’t work the other way around. You can also join the Just Label It! initiative and encourage big food companies and the USDA to add consumer-friendly GMO labeling – http://www.justlabelit.org/ . You may also want to check out the non-GMO shopping guide here to be more informed and know what you are buying. Another great resource is called Local Harvest. This site connects you to local farms, markets and farm-to-table restaurants. They even have an online store – https://www.localharvest.org and ship nationwide. Now I know this article has been focused on U.S. regulations. So if you live outside the U.S. be sure to check your country’s regulations. We have to be our own watchdogs and educate our children and grandchildren because this new “unfood” group isn’t going away anytime soon. P.S. If you missed my article about apples click here. Key S., Et. al. Genetically modified plants and human health. JRSM. 2008. Klumper W., Et. al. A Meta-Analysis of the Impacts of Genetically Modified Crops. PLOS. 2014. Foods derived from modern technology: 20 questions on genetically modified foods. World Health Organization. 2002. Finamore A., Et. al. Intestinal and peripheral immune response to MON 810 maize ingestion in weaning and old mice. J Agric. Food Chem. 2008. Netherwood T., Et. al.”Assessing survival of transgenic plant DNA in the human gastrointestinal tract.” Nature Biotechnology. 2004. Dona A., Et. al. 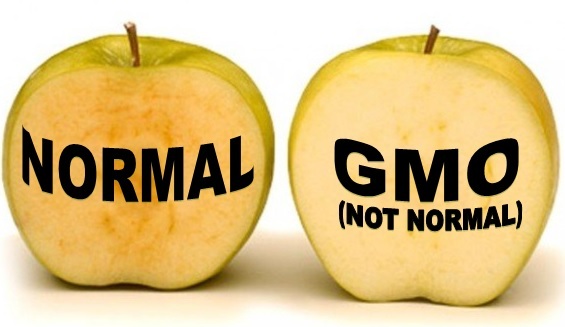 Health risks of genetically modified foods. Crit Rev Food Sci Nutri. 2009. Duke S.O., Et. al. “Glyphosate-resistant crops and weeds: Now and in the future.” AgBioForum. 2009.